The drive sports a protective sliding cover. high-capacity portable storage, allowing you to easily transfer. Item model numberLJDS50-32GABNL2. Sales are final. Retractable connector with convenient thumb slide. 3 Lexar JumpDrive S50 8 GB USB Flash Drive and 1 purple lexar 8GB Lot total 32 GB. Condition is Used. Shipped with USPS First Class Package. lexar 32GB Jumpdrive S37 USB 3.0. Condition is New. Shipped with USPS First Class Package. Flash drives are important because they're portable - you need the convenience of having them wherever you go. Color chosen randomly. Compatible with Windows PCs and Mac computers. Lexar 32GB JumpDrive C20c MICRO-USB PLUS USB 3.1 flash drive. NEW GENUINE. Make transferring photos, music, documents and other files between devices simple. This flash drive twists open to reveal the port, so you won't have to worry about losing a cap during your travels. Hinged jacket rotates to help protect the USB interface. Plug-and-play design enables easy use right out of the box. USB 2.0 interface promotes fast data transfers. USB 2.0 is backward compatible with USB 1.1. Compatible with most PC and Mac computers. Holds up to 32GB of data. Backed by the manufacturer's 5-year limited warranty. Keeping your digital media close at hand allows you to share data and files with colleagues without being tied to your computer. This flash drive provides an easy way to store documents, memos and other information in an easy-to-carry package, so you're always ready with critical data when you need it. 32GB capacity allows you to keep digital media, like photos, files and documents, with you at all times. LED activity light blinks when data is being transferred, so you know when the job is finished. USB 2.0 connectivity is compatible with most devices and provides fast transfer speeds. Special TwistTurn design includes a tough, hinged jacket to keep your data protected while not in use. Built-in key chain hole allows easy attachment to a bag or purse. Compatible with most Windows® and. Exar JumpDrive S75 32GB USB 3.0 Flash Drive SuperSpeed. Model JumpDrive TwistTurn. With so many options, it's easy to find the right 32GB TwistTurn Retrax USB 2.0 Flash Drive product to fit your needs and lifestyle. Assorted Color 32GB USB Flash Drive. Storage Capacity 32GB. You can quickly transfer a 3GB HD movie clip in less than 1 minute, compared to the 4 minutes it takes using a standard USB 2.0 drive. Retractable connector with convenient thumb slide. We'll respond you within the next 24 hours. LOT OF 2 JUMPDRIVES. LEXAR 32 GB. LEXAR S70 32GB JUMPDRIVE HI-SPEED USB.USA!!! SHIPS FREE!!! Lexar JumpDrive, S75, 32GB,"USB 3.0" Flash Drive - WHITE & ORANGE - NEW, SEALED! Brand new, never opened. Lexar JumpDrive, S75, 32GB,"USB 3.0" Flash Drive - WHITE & ORANGE - NEW, SEALED!. Condition is New. Shipped with USPS First Class Package. This is a Lexar Twist Turn Hi-Speed USB Jump Drive with a 32 GB storage capacity. Quickly and securely transfer photos, videos, and files with the affordable, high-performance Lexar JumpDrive S25 USB 3.0 drive. With speeds up to 130MB/s read, 25MB/s write for 16-32GB and 150MB/s read and 60MB/s write for 64-128GB, you can now transfer a 3GB HD video clip in less than 1 minute, compared to the 4 minutes it takes using a standard USB 2.0 drive. These stylish options make it fun and easy to find one to suit your needs and reflect your personality. They also provide you with a built-in color coding system to help you organize your drives and their contents. New Lexar JumpDrive TwistTurn 32GB USB 2.0 Flash Drive - Assorted Color: Green/Pink/Orange. LEXAR JumpDrive 32 GB, USB 3.0 Flash Drive - NEW! NEW - SEALED Lexar JumpDrive 32 GB, USB 3.0 Flash Drive. Capacity:32GB | Color:No Color You are buying 1 Flash Drive | Available in several colors (no color choice). High-capacity USB flash drive lets you take your files wherever you go. You are buying 1 Flash Drive | Available in several colors (no color choice). 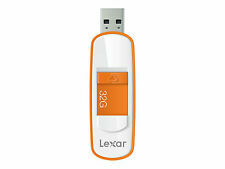 Lexar 32GB USB 3.0 !! Don't mistake this for a USB 2.0 Drive. The affordable, high-performance Lexar JumpDrive S37 allows you to quickly and securely transfer photos, videos, and files with speeds up to 130MB/s for 16-32GB and 150MB/s for 64-128GB. Quickly transfer a 3GB HD video clip in less than 1 minute, compared to the 4 minutes it takes using a standard USB 2.0 drive. Keep sensitive data safe while on the go with the Jumpdrive Fingerprint F35 USB 3.0 from Lexar. The reader is designed to recognize fingerprints in less than a second, and an indicator light flashes once a user's fingerprint has been authenticated. Lexar by Micron 32GB Jumpdrive S75 USB 3.0 :Lexar JumpDrive S75 provides secure, high- performance portable storage backed by Lexar performance, quality, and reliability :Leverages SuperSpeed USB 3.0 technology for fast file transfer :Item is NEW and NOT USED. Retractable connector with convenient thumb slide. Make sure this fits. by entering your model number. Trending at $11.36eBay determines this price through a machine learned model of the product's sale prices within the last 90 days. 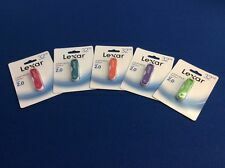 Whether you are in school, working on sensitive files for work, or wanting to save a copy of an important document, the Lexar 32GB USB Flash Drive offers an effective solution. With a maximum storage capacity of 32 gigabytes, you can store plenty of files, photos, videos, or music. All your files will be just a few clicks away with this portable memory card storage solution. How do flash drives work? A Universal Serial Bus (USB) flash drive or memory card is used in a similar way as floppy disks or compact discs (CD), two data storing forms that have grown obsolete as technology has advanced. A flash drive is a portable USB that allows you to store data, back up your data, and transfer computer files. USB flash drives are small, fast, have a lot of capacity for their size, and are resilient, thanks to their lack of moving parts. How do you use a Lexar Memory Card/Flash Drive? Insert your Lexar Flash Drive into the proper USB port on the computer or laptop. If this is the first time you are using the flash drive, the computer may tell you it is "installing hardware." The device will now display as a removable disk drive. Select the files you want to copy by clicking on them, then drag them to your desktop if you are transferring from the memory drive or drag them from your computer to your flash drive if you need to save them there. When you are finished, right click on the drive to eject it. This step allows you to remove the drive without damaging it. How much data can a 32GB Lexar Flash Drive hold? With 32GB of available memory space, you can safely store thousands of data files from music to academic papers. While the answer ultimately lies in the specific sizes of your files and data, 32GB is enough memory space to accommodate roughly 8,000 digital photos. The drive could also hold around 4,000 songs. It could also store thousands of Word documents or PowerPoint presentations, depending on their individual size. How are USB memory card drives and storage clouds different? The following are the highlights regarding the differences. Storage clouds offer an online method of saving data, including files, music, movies, videos, PowerPoint presentations, Word documents, and more. A portable USB flash drive keeps your data secure because it is a hard drive that can be kept with you either on a key ring or in your pocket hidden away from would-be hackers. Content provided for informational purposes only. eBay is not affiliated with or endorsed by Lexar.